Relive the past at Prati Piani. During the 70’s, Prati Piani was the host of the winter training camps held for Inter Milaan and now, together with BootcampTeam we are organizing 4-day Boot Camp training at Prati Piani for the 8th time. In May 2017, we will be conducting 2 separate trainings. Feel like getting away this Spring? Ready to lose those last few kilos while enjoying the wonderful Italian sun in the beautiful Alps? Then join the Bootcamp Team at Prati Piani in Italy. The Bootcamp Trainings are a challenge! We make use of the local surroundings which are rich in wood blocks, tree trunks and hills. 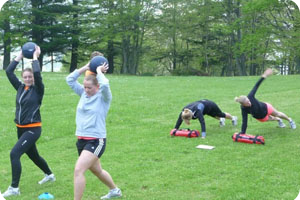 Of course we also use our Bootcamp equipment such as auto wheels, TRX suspension trainers, ropes, etc…In short, enough variety to give you an energetic and satisfied feeling! Cozy evening with a nice Italian wine. Take the first step and book today! For more information, please contact us a info@pratipiani.com.